We’ve reached the core of Summer in the northern hemisphere. If we look inside this core, we find the Sun. This is the season of first harvests and we thank the Sun for what we receive. The golden light of the Sun infuses this season with the gifts of illumination, the ripening of our gifts, and the blessings of life force freely given. This week it is important to talk about the significance of the Sun’s sign—Leo. I want to invoke the wisdom of this season of first harvests and add this wisdom to my New Moon* intentions for this month. I can’t talk about the cross-quarter holy day of Lughnasad, usually observed on August 2, without talking about fire. Each cross-quarter Sabbath happens when the Sun reaches the approximate center of a fixed sign—Beltane during Taurus, Fixed Earth; Lughnasad, during Leo, Fixed Fire; Samhain, during Scorpio, Fixed Water; and Imbolc, during Aquarius, Fixed Air. These elements infuse each of these important Pagan holy days. We need fire. The Sun reminds us that life absolutely depends on this element. Not only do we need fire to sustain life, but we need it to ripen into the lives we are meant to live. I love the image of a sun-ripened peach to remind me of the delicious potential we may reach with help from fire to develop sweetness and blush. So, what feeds your fire? How do you know the element of fire is working in your life? How do you honor this element? These questions seem appropriate for this week of Lughnasad and the Full Moon of Sun in Leo and Moon in Aquarius. All fire signs seek self-expression. They emphasize the individual’s journey to understand the significance of the Self. Identity, self-worth, and meaning are important to fire signs. Every fire sign is connected to an air sign by opposition in the wheel of the zodiac. For instance Leo is opposite Aquarius. Opposite signs need each other for wholeness. Air signs seek relationship. The wholeness of fire signs and air signs is about the relationship of self and other—an ebb and flow that permeates human life. There is no good and bad, or better and worse about these two instincts. We need strong individuated selves and we need to belong to something bigger than ourselves. One of my teachers, Cynthea Jones, taught me my personal key to understanding fire signs when she described fire as the most vulnerable element. Hearing that rocked my world—what a contrary statement to the usual impression that fire is the most powerful, destructive, and feared element. She reminded us that fire needs the other elements to survive. It needs earth for fuel, air for energy, and water, in balance, to burn steady. If any of these elements are missing or are over-supplied, the fire dies. When fire feels vulnerable, and by this I mean the fire of our souls, we can latch onto egotistical behaviors, we can feel isolated, undervalued, and threatened. Fire becomes destructive when it is not tended properly and given what it needs. When I feel those threatening fires within myself, I know I need to practice self-love. I know I need to honor my Self. I believe this is the work of Leo. This week, with both a Full Moon and a cross-quarter Sabbath to honor, we have the opportunity to practice self-love in a sacred way. July 29—Gibbous Moon: Perfecting. Pressure builds under the Gibbous phase of the Moon. 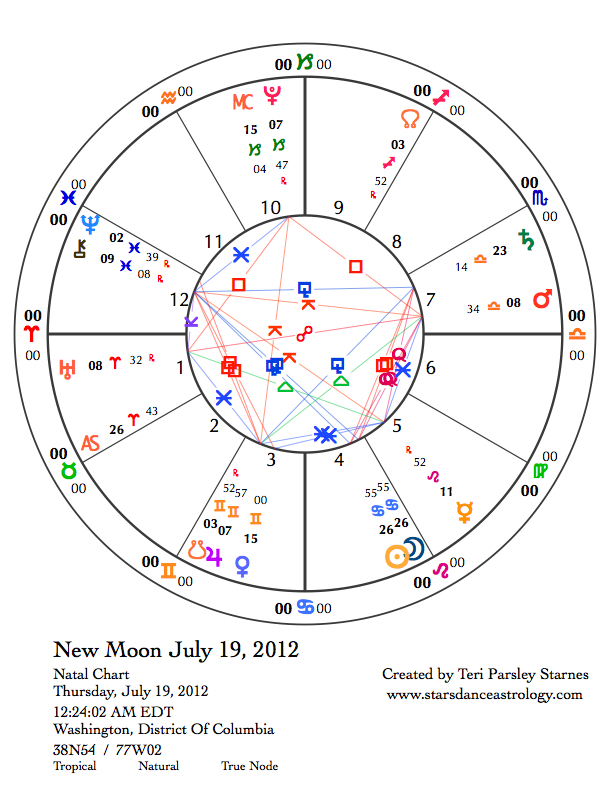 The New Moon of July 19 planted a seed in security-conscious Cancer. We’ve been called to plant seeds that honor our tides of emotion. Under pressure, we may need to take strong measures to affirm our self-worth and continue to honor whatever emotions present themselves. The Moon is in fire sign, Sagittarius. We are encouraged to look to the horizon, to see past current limitations, to discover the truth that gives meaning. What adventure of consciousness gives you a greater sense of your value? What are your gifts that need to be shared? Monday, July 30. A paradox builds today. 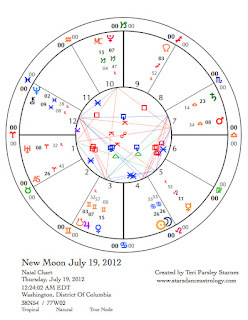 This is the quincunx aspect between the Sun and Pluto. This paradox opens up the Mystery of the relationship between self and the dissolution of self. How do we keep from gravitating to one or the other of these two forces? What kind of stress does this create in you? This is a good day to be kind to ourselves. The Moon is in Capricorn. Self-love may look like taking ourselves more seriously, honoring our goals, and committing to attaining them. Tuesday, July 31. After a stressful contact with Pluto yesterday, the Sun makes a harmonious connection with Uranus today. Fire is emphasized! Part of the journey of self-love is to be who we truly are. This is not a day to hide. Another harmonious aspect forms today between Venus and Saturn. Both of these planets are in air signs and this gives a great deal of support to making connections with others. This connection could be profound when we consider that another quincunx forms today between the Sun and Chiron. This paradox opens the Mystery of awareness of our individual experience of pain and the awareness of global suffering. When I am feeling sorry for myself, my pain is foremost in my mind. It is hard not to apply my whole attention to my own needs. This paradox invites us to split that attention between self and the whole. 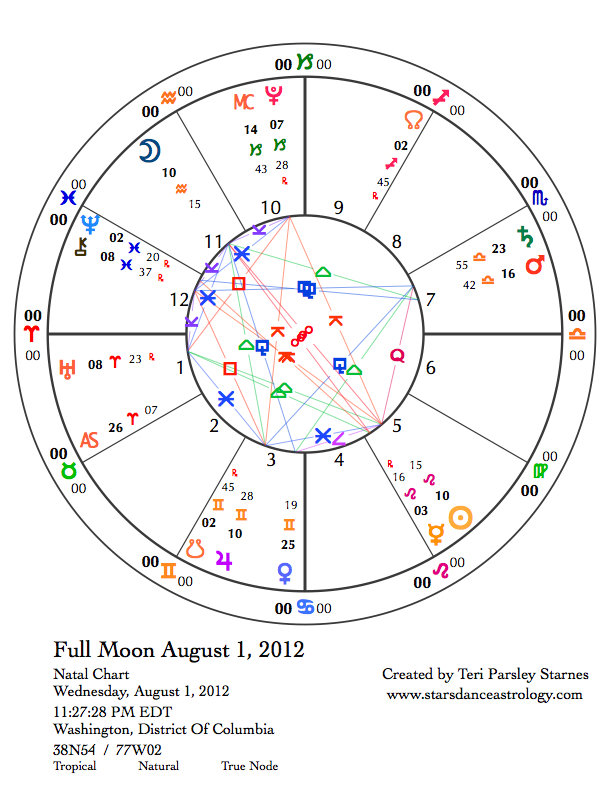 August 1—Full Moon: Illuminating. Open to new understanding and release it into the stars. The release that occurs at the Full Moon is like finally being able to let go of an arrow we’ve been progressively pulling tighter and tighter in our bows. We are aiming toward an intention and now, we get to let it go, no longer able to control its development. I mention this metaphor because there is a configuration of planets in the Full Moon chart that actually looks like this bow and arrow. It is the triangle of Pluto, Chiron, and the Sun bisected with the arrow of the Sun opposite Moon. The arrow is pointing to the Sun. 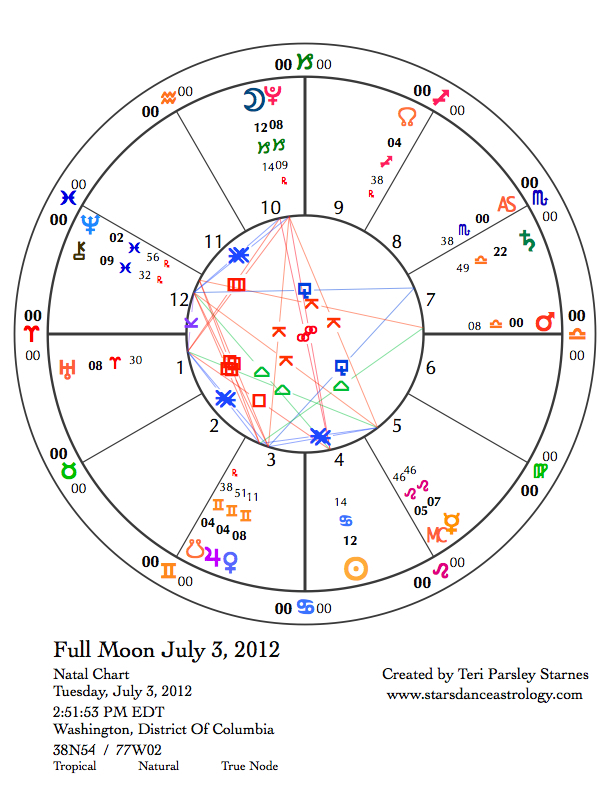 The tension comes from Pluto and Chiron and the force of release comes from the Moon. If you were to aim an arrow into the Sun, what energy would you like it to carry? 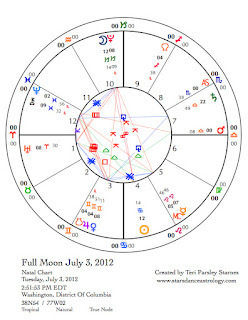 The previous two days, I’ve discussed the paradoxes that Pluto and Chiron quincunx the Sun evoke. Now, we add the energy of Aquarius to the mix. If the Sun represents self-worth, the Aquarius Moon represents the communities we are able to serve with our gifts, the enfolding culture that either nourishes our true selves or becomes the toxic container that undervalues our essential being. We need communities that give us room to be ourselves and in which we can help others to be themselves too. The relationship between the ego and the collective is a stormy one. Often we expect to be affirmed in all we do by others. It doesn’t work that way. Sometimes the feedback we receive is that we still need to work on our issues or take responsibility for our impact. The collective pushes back on our sense of being special. Sometimes this hurts. Often it is a good source of information. 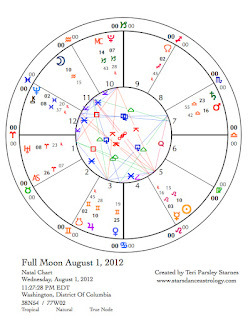 This Full Moon may teach us more about this dynamic relationship. Thursday, August 2. The energy of the Full Moon still resonates today, the traditional day of Lughnasad. We give thanks for our first harvests. Given the energy of the Leo/Aquarius opposition, we look at these harvests in the light of how they feed us individually and collectively. The ways we shine, the gifts we have to offer, are encouraged by Jupiter today. In Gemini, Jupiter embraces opportunity by exchange of information. Make connections. This is a beautiful day to network. Notice the interplay of personal desire with the desires of others. Where do these intersect and feed each other? “There are no small parts, just small actors.” We can all be big today. Friday, August 3. After the high energy of the Aquarius Moon, we get to cool off in the oceans of Pisces for the next two days. Notice your reactions to this shift. For some, it is a welcome relief to let go of the quest for individuation and our place in the group and surrender it all into an experience of unity. For others, the cosmic soup of Pisces can feel like a loss of definition, a reversion back into a primal state. How we react to this shift may be typical or unique for us. I think it depends on external pressures and how flexible we are feeling, as well as how capable we are at holding paradox. There is no blame in however you feel the change today. Just take some time to notice what it is. Mercury, still retrograde (you haven’t forgotten have you?) makes a quincunx connection to Neptune, the co-ruler of Pisces. Communication is strange but could be quite significant. Pay attention to messages. Saturday, August 4. A wonderful way to begin this day could be with a yoga class or doing something in nature where you can forget yourself and relax. The Pisces Moon could encourage escapism and that is OK. Pay attention to the ways you find to leave ordinary consciousness behind. Some ways serve our bodies, minds, and spirits more than other ways. Honor the urge and find a way that encourages you to stick with your intentions for this lunar cycle, remembering to honor emotion and feeding the fires of self-love. That isn’t too much to ask, is it?